In the current business marketing environment, it is important that your company has a professional Internet presence. Most people now use the web to look for goods and services, and often make their purchasing decision based on information they obtain from websites. A website reflects your corporate image and it is important that it look professional, contain up to date information, and is easy to navigate. If you want to attract new customers, your visibility on the major search engines is also very important. RK.Net can help you in all these areas. We’ve developed a wide variety of Internet solutions for businesses and professionals, ranging from small startup sites to larger, more complex ones in a variety of different industries. 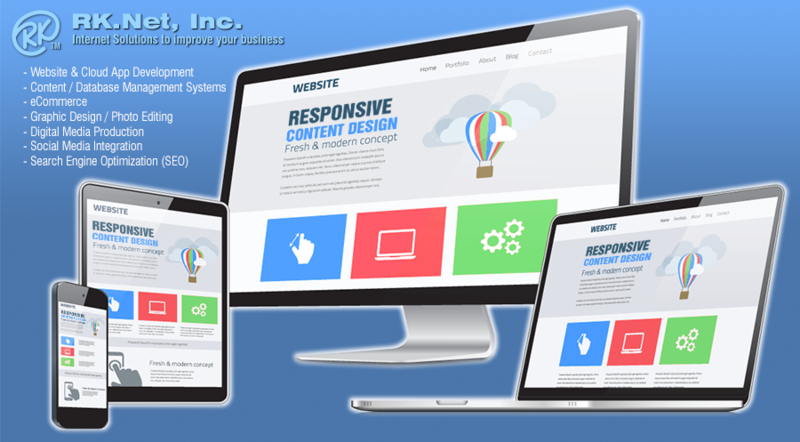 We can develop a website to fit almost any type of budget. We specialize in setting up custom designed content management systems where you can update your website as often as needed using our easy-to-use online administration tools. No web design knowledge is needed to update content, add new pages, add photos, post articles, blogs, etc. We also can integrate your website with Facebook & Twitter to take advantage of social networking. We also have experience in e-commerce and advanced database programming solutions. Your site’s content can be driven by an online database, as well as collect valuable data from visitors who register and/or fill out response or survey forms. We also provide search engine / keyword optimization services to give websites better visibility on all the major search engines. RK.Net also offers a wide variety of hosting plans, which use state-of-the-art facilities and servers. We also have reseller / outsourcing relationships with other web and graphic designers who wish to provide their clients with the advanced programming and online database solutions that RK.Net offers.